Hurakan Condor by the Swiss company Intamin AG is a frightening drop tower which provides the happy customer with a thrilling 3 second free fall ride from a trifling height of about 300 feet or 100 meters. Wanna see how it looks like from the top? Check a Hurakan Condor ride video. 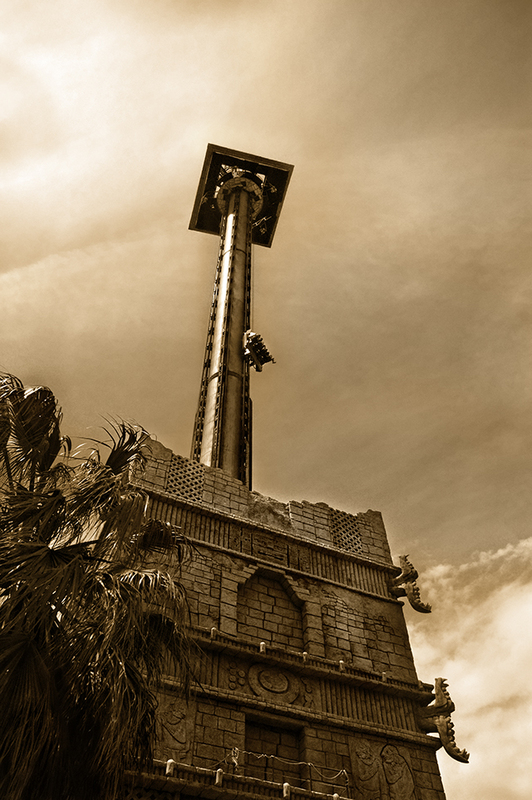 There are other famous attractions in Port Aventura like Dragon Khan which were featured here in the past. I love what you did with this photo, I had to look twice and realize that was an amusement ride...lol. Well done. Exquisite sepia everything! I'm looking at the carvings in the lower part of the building - so lovely - and the corner sconces (for lack of the architectural term!). Wonderfull, love the angle, great sepia conversion. Well done! Enjoy our visits to Barcelona through your eyes. Tweeted with a link to you today. -GuyD thanks. It needed some retouch. Not that I am proud of it. I like the mighty look as taken from below. -Hi, thanks for that Twitter link designslinger! this looks like a fun ride! :D your pictures are beautiful. Well I thought it was some ancient tower until I read the text. I'll certainly pass on watching the video. I wouldn't enjoy riding on any fairground ride but such objects do lend themselves to photography.